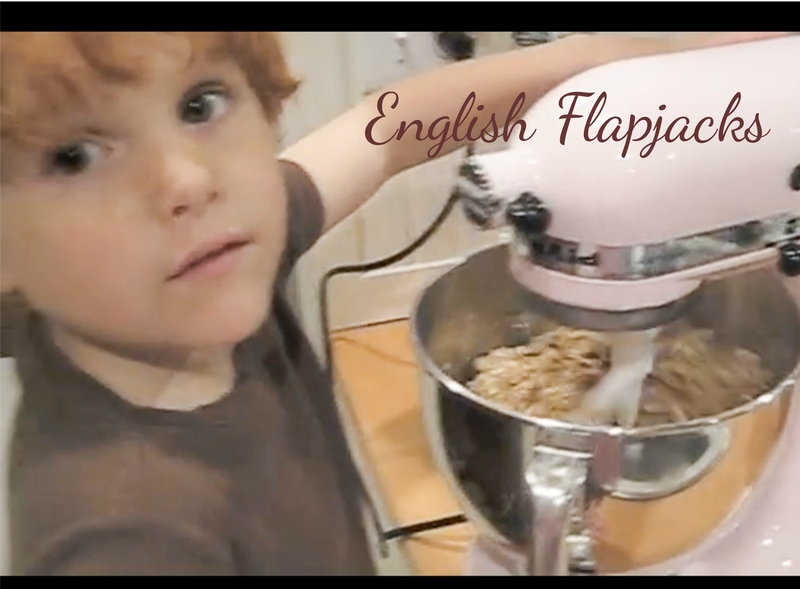 Rémy makes English Flapjacks from Lucy Lean on Vimeo. In honor of St George’s Day – April 23rd – we decided to make English flapjacks. These treats are good for elevenses, lunch boxes or for teatime snacks with a good cup of PG tips. They are sweet chewy oatmeal cookies – think trail mix granola bars that you can’t resist. Each time we make them we add something different depending what we have in the house – sometimes nuts, raisins, cranberries, coconut, pine nuts, pumpkin or sunflower seeds – even mango slices. Another variation is to soak dried fruit in the juice of a lemon and/or orange that you have heated to boiling point with the zest. The citrus cuts through the sweetness. Papa thinks they are the most delicious treats we’ve ever baked… Rémy prefers them straight up with no bits. 3. Gently heat the syrup, butter and brown sugar in a small saucepan until the sugar dissolves and the butter has melted. Take off the heat to cool. 4. In the Kitchen Aid mixer bowl mix the oats and flour. If you are adding nuts, raisins etc mix these in now. 5. Add the mixture from the saucepan and mix everything together on low speed until the oats are well coated. 6. Divide the oat mixture between the two pans and push down gently. 7. Bake in the oven for 30 minutes until golden brown. 8. Remove from the oven and let sit for a couple of minutes then cut into segments with a knife. Let cook a little more and then enjoy – the best ones are the first ones eaten warm from the oven.